Here you will find a wide array of primary/secondary educational resources, Tricentennial information, collections and research available for your use in the classroom. 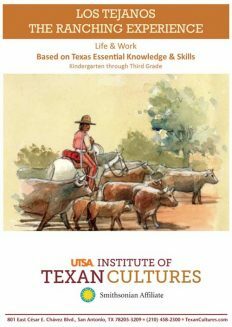 All of our lesson plans and hands-on activities meet TEKS requirements in Social Studies and can be adapted to meet individual classroom needs. They are available in PDF form. If you are having difficulty accessing our resources, make sure you have the latest version of Adobe Acrobat Reader here. 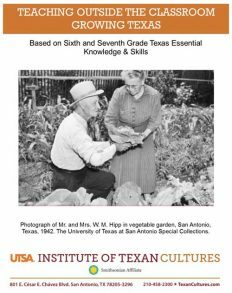 Be sure to also check out the resources and publications available through the UTSA Special Collections and our Collection’s Blog, for additional information. Please take a moment to let us know if these resources are helpful to you by filling out a brief survey here! Twenty-four flags of nations representing Texas’ earliest settlement groups are outlined here. 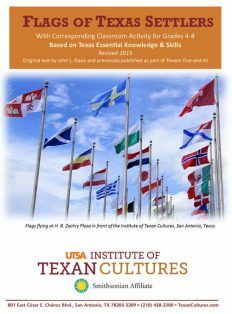 We attempt to answer some of the many questions your students may have about the flags of Texas, the flags of the world’s nations and the flags flown in front of the UTSA Institute of Texan Cultures. This lesson can be used in teaching units on Spanish conquests in the Americas of the early colonization of the United States. It could also be used in a geography unit to illustrate the movement and settlement of people. Time period: Early 18th Century. Drawing from the Briscoe Museum’s collection of hundreds of stereo view cards- soon to be featured in an exhibition coinciding with the Tricentennial – participants will explore images of the people and landmarks of San Antonio from the late 19th- early 20th century. One 60 minute class. U.S. Army officer Seth Eastman made sketches during a trip down the Mississippi River, the Texas coast, and then San Antonio, Seguin and Fredericksburg from 1848-49. Meticulously labeled and dated, Eastman’s sketches provide among the earliest surviving images of the area before the advent of photography. Two of the most influential leaders of the Texas Revolution were native Mexicans. To understand the importance of the contributions of Lorenzo de Zavala and Jose Antonio Navarro, you should consider them in the same company as Thomas Jefferson and Patrick Henry. Both men were passionate about the independence of Texas and am federalist form of government, but came from very different backgrounds. Students will learn about ecosystem restoration as it applies to restoration efforts along the San Antonio River. Students will use a variety of methods to determine the overall health of the river and make an assessment of whether or not restoration efforts appear to be successful. 2 class periods-field trip required. This project is designed to teach students the history of the Alamo prior to the Texas Revolution and help students recognize that event though the Battle of the Alamo took place in 1836 people today still think about and debate questions and issues surrounding the event. Students will review disparate opinions about the battle by contemporary commentators and evaluate the commentators’ accuracy or reasoning. The Tejano experience includes working to create a more just society through struggles for educational rights, worker’s rights, and political inclusion. While there have been gains, the quest for equal protection of the law and the ability to participate equally as Americans is ongoing. The Tejano experience includes working to create a more just society through struggles for educational rights, worker’s rights, and political inclusion. This series of activities can be broken into several classes or used individually as desired. In this lesson, students will research the systems of higher education in Texas, and then conduct more detailed research on three different types of colleges and their basic admission requirements. Two (2) sixty (60) minute classes. In this lesson students will learn about the use of geometric circles and triangles in pre-Columbian art and Mexican folk art, focusing on important motifs within Latin American mythology such as the sun. They will then create a ceramic sun in the same style. This lesson looks at the positive and negatives of peer pressure and challenges students to consider how they can help one another stay on a positive track in life. One (1) sixty (60) minute class or two (2) thirty (30) minute sessions. Transitions are always challenging and sometimes intimidating for students because they grow accustomed to a group of friends, teachers, school rules and school culture. This lesson explores ways students to help one another transition smoothly into the next education chapter, high school. One (1) sixty (60) minute class. 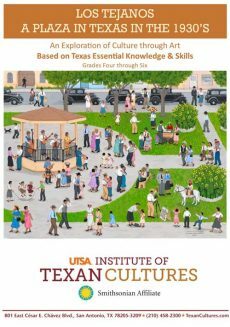 Carmen Lomas Garza’s work, A Plaza in Texas in the 1930’s, offers a glimpse into the past and details a uniquely Texan culture. This resource guide provides students with a visual way to connect with a previous time, and they will use critical thinking skills to analyze and make personal connections with this important work of art. 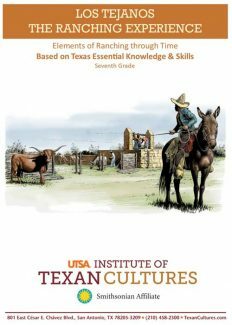 The Ranching Experience explores the legacy of ranching from a unique cultural perspective and offers students a glimpse into what life was like for Tejano people working and thriving on Texas ranches. 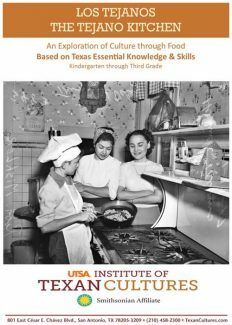 The Tejano Kitchen: An Exploration of Culture through Food resource guide provides students with hands-on learning activities that give them the opportunity to engage with and make personal connections to the past and present, where they will refine critical thinking skills while learning about the uniqueness of Tejano cuisine. This resource guide gives students the chance to learn about influential Tejano activists. 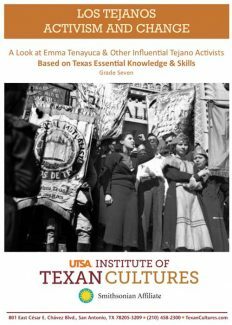 Students will use critical thinking and inference skills to develop a visual timeline for Emma Tenayuca, an important but sometimes overlooked Texan activist. Twenty-four flags of nations representing Texas’ earliest settlement groups are outlined in this activity. 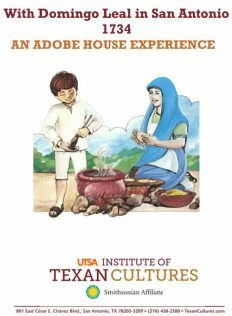 This unique learning experience allows students to follow a day in the life of Domingo Leal, a ten-year-old boy living in San Antonio during the 18th century. 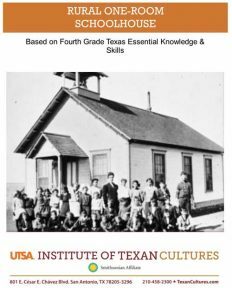 This unique learning experience allows your students to explore what classroom life was like for students living in rural Texas during the late nineteenth century using primary sources. This activity allows students to participate, imagine, compare, contrast and immerse themselves in a nineteenth century frontier fort. 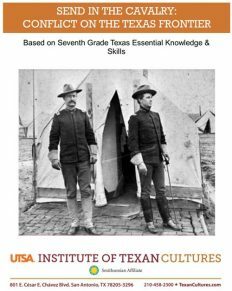 This engaging activity includes images and documents intended to inspire outdoor education and participation, while focusing on the geography of Texas. 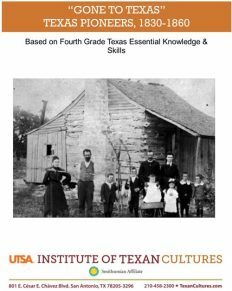 This lesson plan introduces fourth grade students to Texas Pioneer Culture using primary sources. 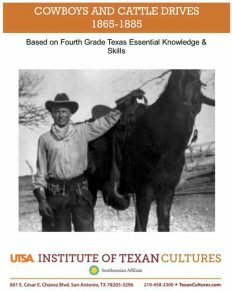 This lesson plan uses primary sources to provide an introduction to Cowboy Culture in Texas. ITC Members Get Access to Premium Educator Resources! the Premium Educator Resources available. Are you a current ITC Member? Ready to become an ITC Member. Click for more information.